Bottom of the Financial Crisis: Could the Greeks turn their Backs on the West? There is a new fear among the spokesmen of the British Empire, that not only could Greece default on its debt and thereby bring on financial Armageddon, but that Greece will “turn eastwards” towards Russia and China. Russia supplies Greece with the majority of its oil and gas, says Barber, noting that Greece and Russia share the Orthodox religion. He also points to fact that the Left in Greece has historically been critical of NATO and the West. In a move that was considered highly symbolic and representing the deepening of ties between the two Churches, Kirill was given relics of St. Lazarus, one of the most important saints of Cyprus, which will be placed in a monastery in Moscow. 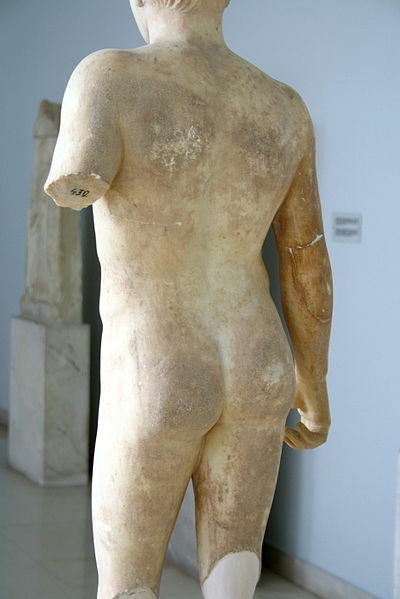 Detail from a marble statue of an ephebe (portrayed as an athlete), possibily a funerary one, on display in the Room of the Attic funerary stelai, at the first floor of the Archaeological Museum of Piraeus (Athens). Circa 400 BC. Picture by Giovanni Dall’Orto, November 14 2009. – The copyright holder of this file allows anyone to use it for any purpose, provided that the copyright holder is properly attributed. Redistribution, derivative work, commercial use, and all other use is permitted. This entry was posted in Finance and Economics, Geopolitics, World News and tagged Cyprus, financial crisis, Greeks, Orthodox, Russia, turn, west by cnlib. Bookmark the permalink.